The ground level of The Triangle Superstar Café in GTA IV. The Superstar Café is a high-end venue restaurant in Grand Theft Auto IV and Grand Theft Auto: Chinatown Wars, a play on the Hard Rock Cafe or the All Star Cafe. There are two Superstar locations in GTA IV: one in The Triangle and one in north Middle Park East at the intersection of Quartz Street and Bismarck Ave. Both locations are accessible but the player cannot purchase food there to replenish health. However, players can take their friends or girlfriends to the café. Alex Chilton and Brucie Kibbutz seem to be particularly fond of this restaurant. The interior of the cafe, which is used for both Superstar outlets, consists of two floors, with the lower level furnished with basic dining tables and chair, a bar and a staging area for musicians, and the upper level containing posher sofas and tables. Occasionally, a saxophone playing busker will spawn on the staging area, by the microphone, playing jazz music; as usual, players can give the busker $10 in exchange for full health. The radio station IF99 can be heard playing in the background. 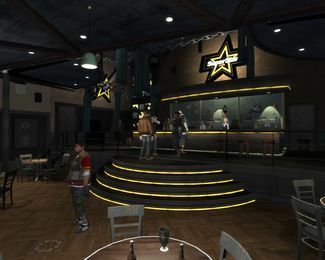 The Superstar Café also appears in Grand Theft Auto: Chinatown Wars although it cannot be entered. In the first mission for the random character Jeff in GTA IV, Niko Bellic comes here to photograph Jeff's wife and friend. The Stubbs' Dirty Laundry mission First Impressions in The Lost and Damned, Johnny Klebitz assassinates a politician who is inside the café. Second floor of The Triangle Superstar Café's interior, GTA IV. Exterior of the Lancaster Superstar Café, GTA IV. Exterior of The Triangle Superstar Café, at night, alongside Canyon Entertainment, GTA IV. Exterior of The Triangle Superstar Café, at night, GTA Chinatown Wars. This page was last modified on 16 May 2014, at 00:19.